Chemnitz, Germany, March 13, 2018—3D-Micromac AG, a leading supplier of laser micromachining and roll-to-roll laser systems for the photovoltaic, medical device and electronics markets, today unveiled its Clean Scribe technology, a new patent-pending feature for its microDICE™ laser micromachining system that enables particle-free scribing of silicon carbide (SiC) wafers without the need for expensive coatings and without impacting wafer dicing throughput. Clean Scribe works seamlessly with 3D-Micromac’s TLS-Dicing™ (Thermal-Laser-Separation) process integrated into the microDICE system to provide fast, damage-free and cost-effective wafer dicing with no additional material or equipment overhead. Scribing is an essential step in wafer dicing. 3D-Micromac’s TLS-Dicing approach is a two-step process involving the use of a short ablation laser to produce an initial scribe at the beginning of each cut in the dicing street in order to initiate a crack. This “dry” scribe process generates a very low number of particles. Then, in the second step, a continuous wave laser is passed along this line to heat up the material locally, which is then rapidly cooled by spraying with deionized (DI) water, cleaving the wafer. To enhance the reliability and straightness of the cleave, the initial scribe can be performed across the entire length of the dicing street. However, this “continuous scribe” can generate a greater number of particles, which may be too much for certain particularly demanding SiC applications. To avoid this, customers previously needed to reduce the speed of the scribing process or apply an additional wafer coating step before dicing to prevent particles from falling into the dicing street. However, this step adds significantly to process complexity and cost. 3D-Micromac’s new Clean Scribe technology uses a patent-pending laser scribing process that eliminates polyimide and metal particles in the dicing street, enabling a virtually particle-free surface without the need for expensive coatings. 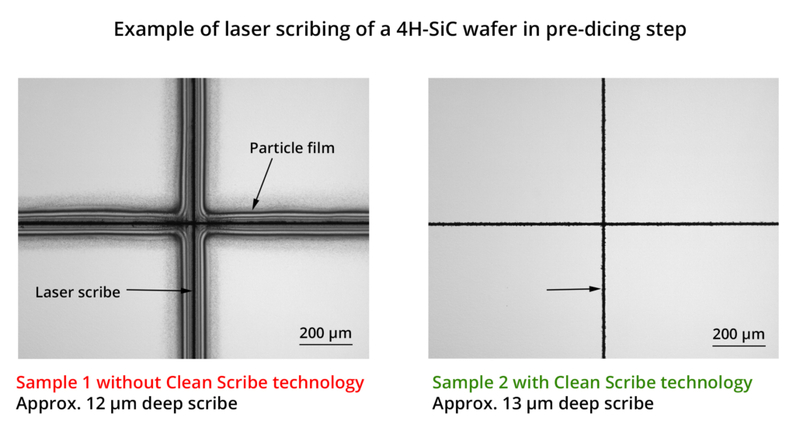 Clean Scribe replaces the “dry” scribe approach with an aerosol spray that uses an extremely small amount of DI water (less than 20 ml/min) to wash away the particles during the laser processing step. Since the TLS-Dicing process already uses DI water and compressed air for the cleaving step, no additional systems or consumables are needed with Clean Scribe. At the same time, Clean Scribe achieves these results with no loss of throughput—enabling wafer dicing speeds of up to 300mm/sec. Clean Scribe works seamlessly with 3D-Micromac’s TLS-Dicing process in the microDICE system. TLS-Dicing provides significantly higher throughput, higher yields and greater functionality compared to traditional die-separation technologies. For example, throughput is up to 15X greater compared to saw dicing. A forceless and contactless machining process, TLS-Dicing eliminates tool wear and requires no expensive consumables for surface cleaning—resulting in cost savings of up to an order of magnitude or more. TLS-Dicing in combination with Clean Scribe is ideally suited for silicon carbide (SiC) wafers, which are extremely hard and brittle and thus make dicing with traditional technologies challenging and expensive. As a result, the microDICE system from 3D-Micromac is an essential tool in the manufacture of SiC-based power devices, solar inverters and optoelectronics. 3D-Micromac is showcasing its new Clean Scribe technology on its microDICE laser micromachining system at SEMICON China, being held March 14-16 at the Shanghai New International Exhibition Centre. Attendees interested in learning more about these products are invited to visit the company’s booth #1685.